Text: April 21. — Hamlet was acted yesterday at Covent-Garden, and Kemble, the reigning prince of the English stage, filled the principal part. He understands his art thoroughly, but wants spirit and nature. His manner is precise and artificial; his voice monotonous and wooden; his features are too large, even for the stage. Munden in the part of Polonius, and Fawcett in the grave-digger, played charmingly. It is enough to mention the grave-diggers, to awaken in France the cry of rude and barbarous taste; and, were I to say how the part is acted, it might be still worse. After beginning their labour, and breaking ground for a grave, a conversation begins between the two grave-diggers. The chief one takes off his coat, folds it carefully, and puts it by in a safe corner; then, taking up his pick-axe, spits in his hand,— gives a stroke or two,— talks,— stops,— strips off his waistcoat, still talking, — folds it with great deliberation and nicety, and puts it with the coat, then an under-waistcoat, still talking, — another and another. I counted seven or eight, each folded and unfolded very leisurely, in a manner always different, and with gestures faithfully copied from nature. The British public enjoys this scene excessively, and the pantomimic variations a good actor knows how to introduce in it, are sure to be vehemently applauded. The French admit of no such relaxation in the dignité tragique. much less would he or his school have approved of an alliance between tragedy and farce. Yet it may well be questioned whether the interest is best kept up by an uninterrupted display of elevation. For my part, I am inclined to think that the repose afforded by a comic episode renovates the powers of attention and of feeling, and prepares for new tragical emotions more effectually than an attempt to protract these emotions during the whole representation could have done. It is by no means usual for the different actors of the same scene, in real life, to be all equally affected. The followers of a hero do not feel as magnanimous as himself, and are even apt to laugh among themselves at his vices or his virtues. The hero himself is not always a hero, and does not speak invariably in the same tone. Indeed I do not know that it is unnatural for the same person to laugh and cry, within the same half hour, at the very same thing, or at least various views of the same thing; nor that this inconsistency of the human mind might not furnish stronger dramatic touches than the contrary quality. Poetical excitement cannot be maintained long at a time; you must take it up and lay it down like a flower, or soon cease to be sensible of the fragrance. If real illusion could ever take place in dramatic representation, it would certainly be produced rather by that diversity of tone and character which exists in nature, than by an artificial unity. But nobody does, in point of fact, forget for a moment, that what he sees is a fable, and, if he did, the effect of a tragedy would hardly be pleasure. We look on poetical terrors as we do from the brink of a precipice upon the yawning chasm below; it makes our head turn, and takes off our breath for very fear ; but, leaning on the parapet-wall, we feel all safe. Looking on the verdure and mild beauties around us, we enjoy the contrast; and, meeting the eye of our companion, exchange a smile. Voltaire, D’Alembert, and many other foreign critics, agree in reproving this scene of the grave-diggers as horribly low, while they extol the soliloquy of Hamlet. Supposing, however, the sentiments of the prince had been put into the mouth of the peasant, and those of the peasant given to the prince, I question whether these critics would not still have taken part with the latter against the former. It is the spade and the jests which discredit the philosophy, yet there is a certain coarse but energetic fitness between the one and the other, — and the tone of buffoonery does not ill accord with the contempt of life, its vanities, and empty greatness. I have made a free translation of these two scenes, endeavouring to convey the ideas rather than the words, that my French readers may judge for themselves. lofty shades of hewn stones 150 feet above your head; — while the country-house of the wealthy citizen of London, mimicking that taste of architecture, excites a smile, — and if he should carry the imitation beyond the pointed arch, and painted windows, to the very indecencies I have mentioned, the ridicule would be complete. The after-piece was Blue-Beard, which outdoes, in perversion of taste, all the other showy stupidities of the modern stage. A troop of horse (real horse) is actually introduced, or rather two troops, charging each other full speed, — the floor is covered with earth, — the horses are Astley’s, and well drilled; they kick, and rear, and bite, and scramble up walls almost perpendicular, and when they can do no more, fall, and die as gracefully as any of their brethren, the English tragedians. All this might do very well at Astley’s, but what a pity and a shame that horses should be the successors of Garrick, and bring fuller houses than Mrs Siddons! Comments: Louis Simond (1767-1831) was a French travel writer. He journeyed through Britain over 1810-11, writing his published account in English. 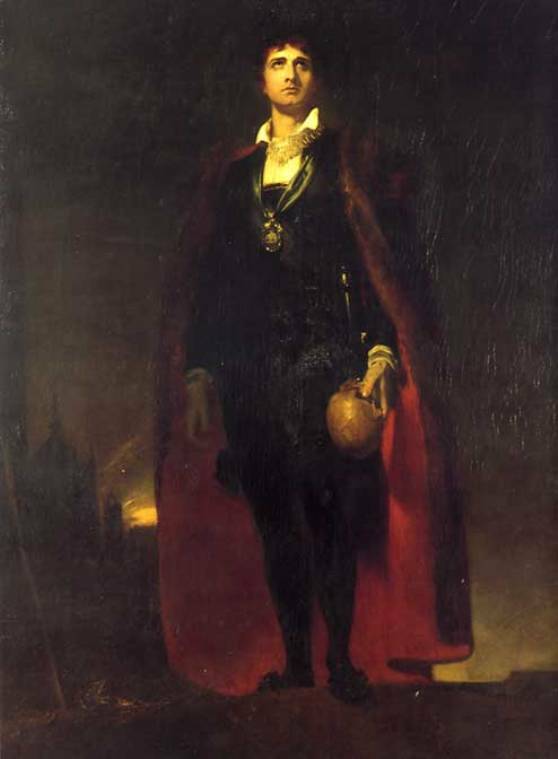 The production of Hamlet that he saw at Covent Garden featured John Philip Kemble as Hamlet and Joseph Munden as Polonius and John Fawcett as the gravedigger. The afterpiece was George Colman the Younger‘s 1798 play The Grand Dramatic Romance Bluebeard, or Female Curiosity. Astley’s Amphitheatre in London was famed for its circus and equestrian entertainments.